Then, walk down Via della Vigna Nuova, and you will find Piazza Santa Trinità. Visit the church that hosts works by Monaco, della Rabbia and the astonishing frescoes by Ghirlandaio, which are in the Sassetti Chapel. Following the Arno River, you will arrive at one of the must see place in the city: the Ponte Vecchio, surrounded by its famous goldsmith shops. 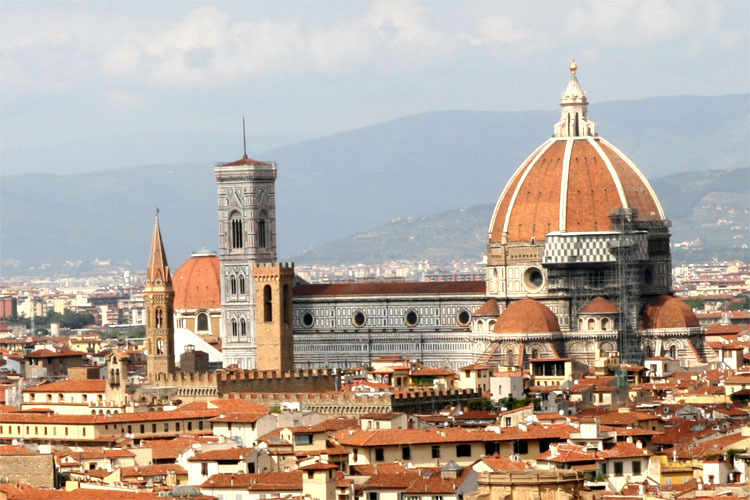 From there, it is possible to admire the very well known Florentine palaces. Relax a little bit, taking all the pictures you want and entering into all the small souvenir shops. Whenever you are ready to walk again, go to Via Santa Maria in order to get to Piazza della Repubblica, which has always been, since the time of the Roman foundation, the centre of the city. Go straight on and you will find the Strozzi family Palace, which nowadays hosts very important temporary exhibitions. Go to Via Tornabuoni, which is the most elegant street in Florence, and walk around, looking at the sofisticated palaces and shops of the worldwide brands. You are almost done: the last place will be San Lorenzo central market, a work by Giuseppe Mingoni inaugurated in 1874. If you want to discover the city not only from an artistic point of you, but also from a gastronomical one, stop there and have a look around, in order to increase the knowledge of the Florentine specialties.